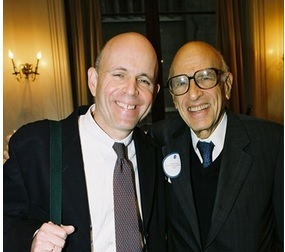 Walter Schloss with his son Edwin at the Columbia Business School. I’ve written before that, to succeed at investing, you do not to be a credentialed individual. You don’t need an MBA. In some cases, you don’t even need a college education. No investor proved that notion more thoroughly than Walter Schloss—a man who never attended college, but very well could be the most underrated investor of the 20th century. Schloss’s record speaks for itself: he compounded wealth at a rate of 15-16% (and that is the figure after you remove the fees he charged) from 1952 to 2002, during a time at which the broader American stock market indices increased at a clip slightly above 10%. Despite this enormous success, the closest Schloss ever came to “mainstream” in the investor world occurred when Buffett mentioned Schloss in his “Superinvestors” essay in 1984, and then late in his 2006 letter to shareholders of Berkshire Hathaway in which he referred to Schloss as one of the good guys of Wall Street. Part of the reason why Schloss never got excessive media attention is due to the fact that he kept his practice small; he only invested on behalf of 75-100 clients. With Buffett and Munger, you have Berkshire Hathaway in the public eye—and an ownership stake is open to anyone. You could visit Loyal3 and buy a Berkshire B share as long as you have $125. With someone like Peter Lynch, you had the Magellan Fund at Fidelity to propel him to fame—a fund that anyone with $2,500 to invest or a special relationship through an employer to invest a lower amount regularly. Schloss didn’t offer that kind of easy access. On one hand, investing on behalf of “the little guy” has tremendous appeal because it jives well with our egalitarian notions about America—anyone who puts forth the effort, saves a little something, opens up a brokerage account, and submits a buy order for BRK.B can have Warren Buffett making decisions in his or her behalf. When the brainpower of people like Schloss are beyond the reach of most Americans, with only the wealthy able to have access, something seems lacking. Personally speaking, I don’t see it that way because running a fund that is able to be bought by anyone often lends itself to quarterly evaluations, success measured by the “what have you done for me lately?” stick, and panic selling during market declines (moments when someone like Schloss would want to be buying). I can’t begrudge someone for not wanting to play that game—if, you, say, recognized BP as a great deal as its price was falling from the $40s to the $20s during the oil spill, and loaded up in a material way, you could have to deal with a lot of caturwailing from some investors who want to know where their stock mutual fund that you’re running perfomed 10% worse than everyone else that quarter. By limiting himself to investors that trusted him and thought in five year increments rather than twelve-month periods of judgment, Schloss was able to do his thing by living his life on his own terms. Interestingly enough, Schloss’s approach to investing was quite at odds with the style of investing discussed on this site. He did not care at all about the quality of the business—he focused solely on measures of cheapness, and salivated at the thought of finding securities trading below their working capital levels. Even though a fair amount of companies that Schloss selected went bankrupt, the ones that recovered overcompensated for this, and Schloss practiced extreme diversification by packing over 1,000 global stocks into his fund at a given time, although they were nowhere near equally weighted (the public records of Schloss’s decisions have been hard to come by, but based on editorial comments from Alice Schroeder’s Snowball about Buffett’s life, my guess is that Schloss had dozens of companies go bankrupt within his portfolio over most 3-5 year rolling periods, and this figure probably amplified during dives in the economy). You might fairly be wondering: Why on earth would Schloss own 1,000 stocks in his fund, roughly double the S&P 500 (I say “roughly” because there are times when the S&P 500 only carries 497, 498, or 499 stocks here and there)? It’s important to remember that these people didn’t exist in a vacuum. In the case of Benjamin Graham, he became “the dean of diversification” because he grew up extraordinarily poor and had to witness local grocers mocking checks written by his mother—the local grocery stores would only accept cash from them. As for Schloss, he had to deal with seeing his father’s warehouse burn down, and his mother’s inheritance squandered in concentrated bets right before the crash of ’29 that caused banks trading at 8-16x book value collapse to a third of book value (causing extraordinary, permanent loss). Much to Schloss’s credit, he did not turn away from business and curse the name of the American economy. He would have been forgiven for doing so, given the misery it caused his parents. Instead, he adapted. He rephrased, “How can I learn from the failures of my parents and succeed?” A courageous question to ask, and Schloss answered by practicing widespread diversification (at a rate far in excess that practiced by his investing peers) applied to a set of stocks that appeared objectively cheap. There are three ways you can incorporate a margin of safety into your investing style: you can diversify, you can buy cheaply, and you can buy quality. Schloss spent his life focusing on the first two. Equally amazing as everything else, Schloss practiced his craft with quiet dignity. He would read financial statements, and always read the footnotes first—he figured that’s where the companies hid the good stuff. He would finish his working day at 4:30 PM, leave work, and not think about investments any more after that. Most importantly, Schloss was a man who believed in himself. When he went to work at Graham-Newman, he was seen as several spots on the totem pole below Buffett. People who saw Schloss then figured he would be a mid-tier employee, earning an average American salary for the duration of his life. Schloss knew he was capable of more than that. He left the stable confines of Graham-Newman to strike it out on his own as an investor, and at the time he was doing it, his peers weren’t thinking that it was the birth of one of the most brilliant careers in American investing history. A lot of people that weigh these things will go on believing that, say, Warren Buffett was a better investor. After all, Buffett spent his life compounding wealth at 20% for no fee at Berkshire, while Schloss earned his investors 16% net of fees at his operation. But you can’t say that—they sought different things out of life. For Buffett, investing was all encompassing. He had to have private companies, and investing was never off of his mind. Buffett’s biography is filled with Buffett stepping out of his vacation home on Laguna Beach to do business deals that were presenting themselves. Schloss never had insurance float, or private cash flowing in from businesses he controlled. When it was 4:30, Schloss was done for the day. No more investments—because that is how he wanted to structure his life. He lived it all on his own terms, and that is the great lesson from his life. Most people have no idea who he was, but the glory of his life is not diminished by our own ignorance.